Sequences of cyclic sedimentary rock layers exposed in an unnamed crater (located at 8N, 353E) in Arabia Terra, Mars. New imagesof rock layers at Mars' surface have given scientists evidence of climateswings on ancient Mars that were driven by the wobbling of the red planet'saxis ? the same mechanism that causes Earth's ice age cycles. The stereotopographic maps of rock outcrops within four craters of Mars' ArabiaTerra region were obtained by the high-resolution camera onboard NASA's Mars ReconnaissanceOrbiter, which is still circling the planet. The teamlooked at the layering of deposits of sedimentary rocks in the outcrops to seeif they could discern any patterns. The layers were a few meters (yards) totens of meters thick. At Becquerel crater, the researchers found an alternatingpattern of layers within layers that suggests that each one formed over aperiod of about 100,000 years as a result of cyclical climate changes. These cyclesare a result of the changing degree of tilt of Mars' orbital axis, theimaginary line running between a planet's two poles around which it rotates, saidstudy leader Kevin Lewis, a graduate student at Caltech. "Dueto the scale of the layers, small variations in Mars's orbit are the bestcandidate for the implied climate changes," Lewis said. "These arethe very same changes that have been shown to set the pacing of ice ages on theEarth and can also lead to cyclic layering of sediments." The studyis detailed in the Dec. 5 issue of the journal Science. The tilt ofEarth on its axis varies between 22.1 and 24.5 degrees over a 41,000-yearperiod. That seemingly small variation leads to large changes in the amount ofsunlight reaching the polar regions of Earth ? when less sunlight reaches thepoles, more ice can accumulate there, leading to ice ages that can last thousandsof years. Mars' tilthas more variation than Earth's, wobbling by tens of degrees over a100,000-year cycle, which can produce even more dramatic changes in climate.When Mars' axial tilt, or obliquity, has been low, the poles have been thecoldest places on the planet, which has resulted in atmospheric changes thatcan impact how material is deposited. And whenthe poles are colder, water and carbon dioxide in the atmosphere migrate pole-wardwhere they are lockedup as ice. When the obliquity is higher though, the poles get more sunlightand the water and carbon dioxide migrate way. 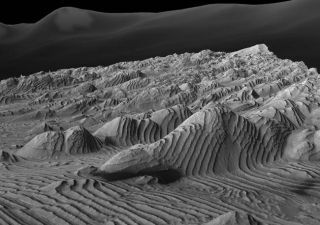 "Ifyou move carbon dioxide away from the poles, the atmospheric pressure wouldincrease, which may cause a difference in the ability of winds to transport anddeposit sand," said study team member Oded Aharonson, also of Caltech.This could change the rate at which material is deposited on the Martiansurface. Thechanging tilt would also affect the stability of any surface water, which wouldalter the potential for sand grains to stick together and cement into rocklayers. In additionto the apparent 100,000-year cycle of layering, every 10 layers in the craterswere bundled together into larger units that correspond to a longer climatecycle of about one million years, the scientists found. In Becquerel crater,the 10-layer pattern is repeated at least 10 times. Theone-million-year cycle corresponds to a known pattern of change in Mars'sobliquity caused by the dynamics of the solar system. Manygeologic processes, in addition to changes in atmospheric density and surfacewater stability, could change with Mars' wobbling, so researchers can't tie thesediment layering patterns to any particular geologic processes. But, "astrength of the paper is that we can draw conclusions without having to specifythe precise depositional process," Aharonson said. "Thisstudy gives us a hint of how the ancient climate of Mars operated, and shows amuch more predictable and regular environment than you would guess from othergeologic features that indicate catastrophic floods, volcanic eruptions andimpact events," Lewis said. "More work will be required to understandthe full extent of the information contained within these natural geologicarchives."